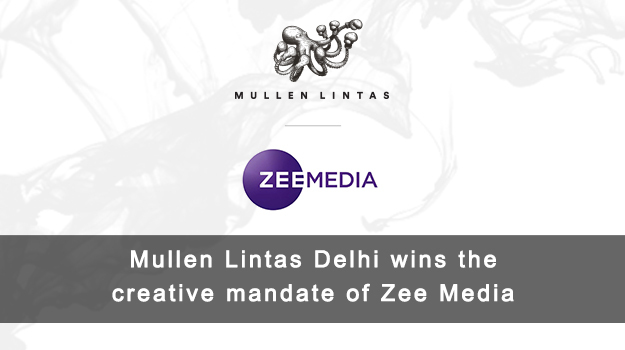 Zee Media Corporation Limited has appointed Mullen Lintas as its creative agency. The win is an outcome of a hard-fought multi-agency pitch involving industry heavyweights and client’s rostered agencies. Zee Media is one of India’s largest news networks with 14 news channels in 8 different languages reaching over 220 Mn viewers. The agency’s mandate is for Zee News, one of the most popular Hindi news channels in India, along with other channels including ZEE Business, ZEE Hindustan, ZEE 24 Ghanta, ZEE 24 Taas, ZEE 24 Kalak and Zee Digital. While the Indian economy is still somewhat reeling under the after-effects of demonetization and momentary uncertainty caused by GST reforms, the Media & Entertainment sector has clearly defied the odds. As per FICCI-EY Re-imagining India’s M&E Sector report, the industry grew at 12.6%, almost double of GDP growth. That said, the television news industry in India is witnessing a boom with many news outfits who have found their share of attention by way of mobile apps or online services like YouTube. In the midst of such burgeoning competition, the primary task for the agency will be to go beyond traditional media in order to further popularize ‘Zee Media Channels’ by creating relevant brand experiences. Sharing his thoughts about the win, Syed Amjad Ali, President, Mullen Lintas, said, “It was an exciting brief to crack. We breathe news, breaking news, biased news, fake news, divisive news, etc. News talks to us from within, and has become part of our sub-conscious. And each one of us at Mullen are designed like that. We leveraged this collective thinking and put it to use for Zee Media. Quite natural for us to find a meaning for Zee which resonated with them”. The business will be handled by the Delhi (NCR) offices of Mullen Lintas where a multi-disciplinary team has been devoted to develop the brand footprint.